Random fact – Collects plush animals after each visit to an animal park; there is an octopus in her car from the aquarium! After her first experience with aerial silks Robyn fell deeply in love with being aerial, now three years later the love has only grown stronger! She did jazz, tap and ballet when she was younger but never felt as passionate as she does with the silks, they have changed her ideas on what constitutes a good workout! 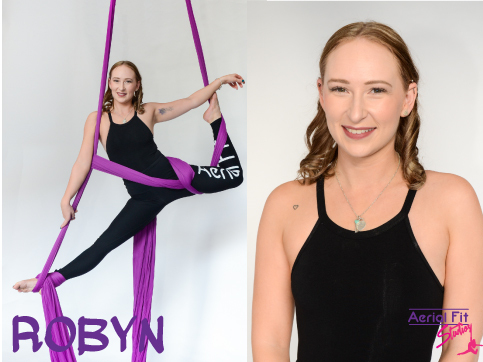 Robyn loves the way her body has changed and the way she sees her body since starting aerial silks and how strong she feels! It’s like being Iron Man! During classes there is nothing more satisfying than nailing a new trick or mastering a new drop, it is even more enjoyable watching someone else conquer a move they have been working so hard for – the excitement and pride that comes with that radiates through the entire class and she can’t wait to share these experiences with students!